I find I'm clinging to these last days of summer. Soon, I know I'll be immersing myself in fall's bounty and loving every bite. But until I start devouring apples and squash, I still have summer produce on my mind. 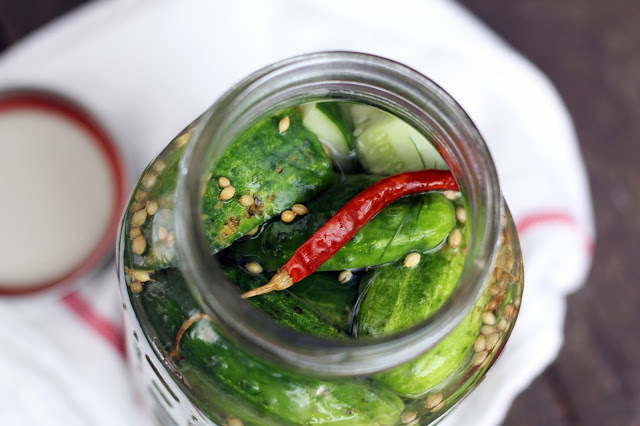 Remember those pickling cucumbers I picked up at the Ballard Market earlier this month? I had plans for them when I stashed a couple pounds in my bag. Over the past year, I’ve caught the fermenting bug and now jars of kombucha sitting on top of my fridge are a normal sight, kimchi and sauerkraut are common topics and I’m finally having some success in making yogurt. 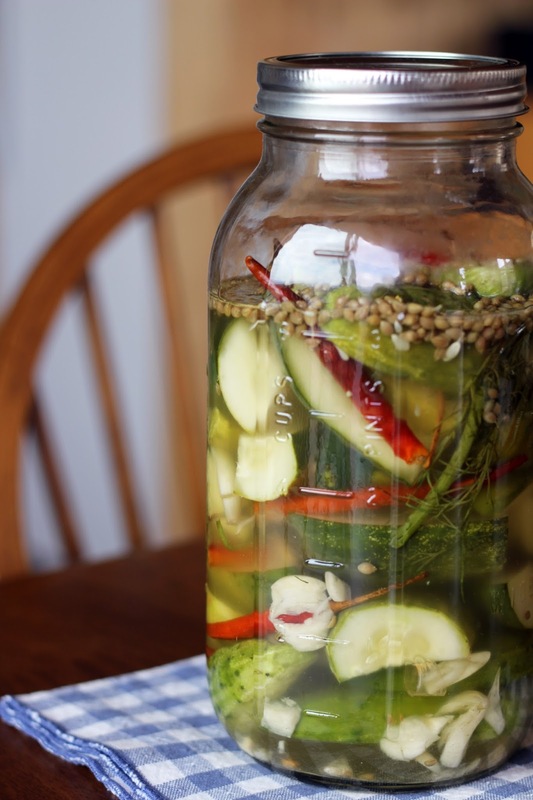 Pickles are another wonderful fermented treat. 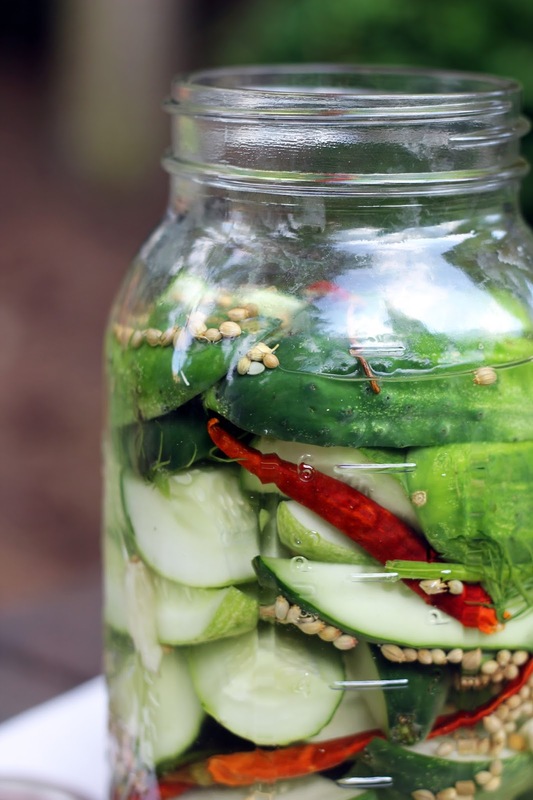 During the summer months, pickling cucumbers start showing up at the markets. They tend to be smaller and firmer than regular slicing cucumbers and may have a rather spiny skin. After washing and slicing them, they are immersed in salty water to begin fermenting. No vinegar is used. Flavors can be added, and for these pickles I layered in coriander seeds, garlic, fresh dill and a handful of dried red chiles. I began my batch of pickles in Seattle and then brought the jar along with me to the Methow Valley and let them ferment for a few days. 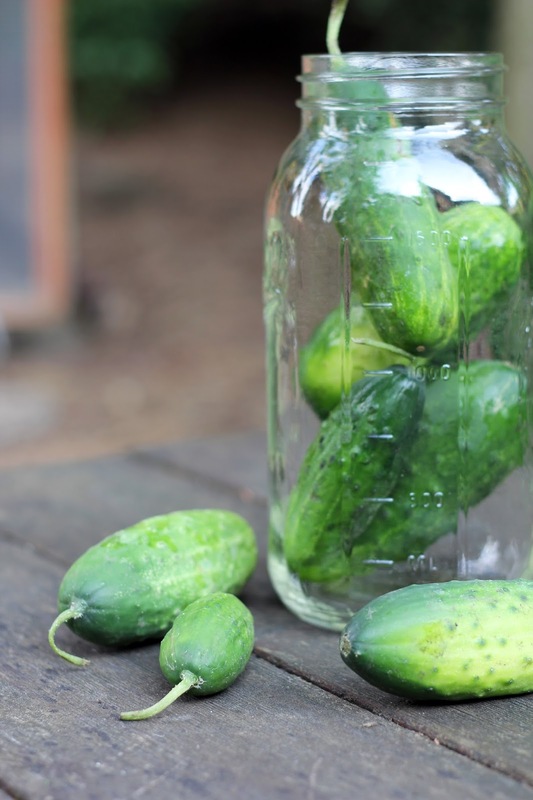 Some fermenting variables are the temperature of your kitchen, the amount of salt used and the size of your cucumbers, as smaller slices will ferment faster. My cabin kitchen is very warm these days, so we began crunching away soon. 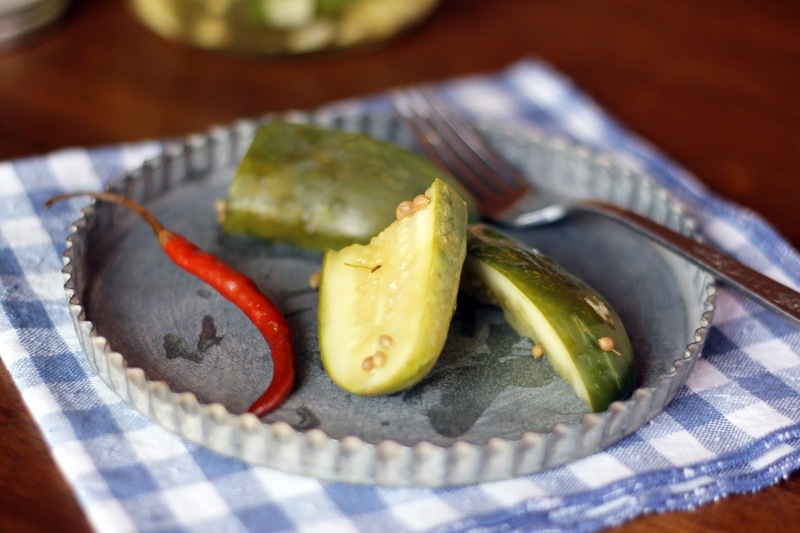 These pickles have pizzaz! 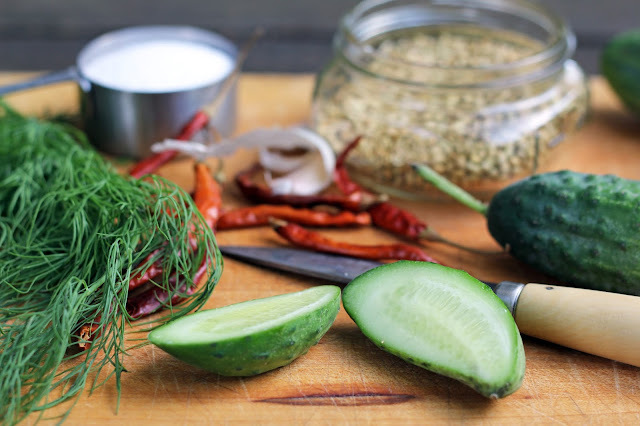 The fresh dill and coriander seeds lend an herbal note, while the garlic and chiles bring a spicy punch. 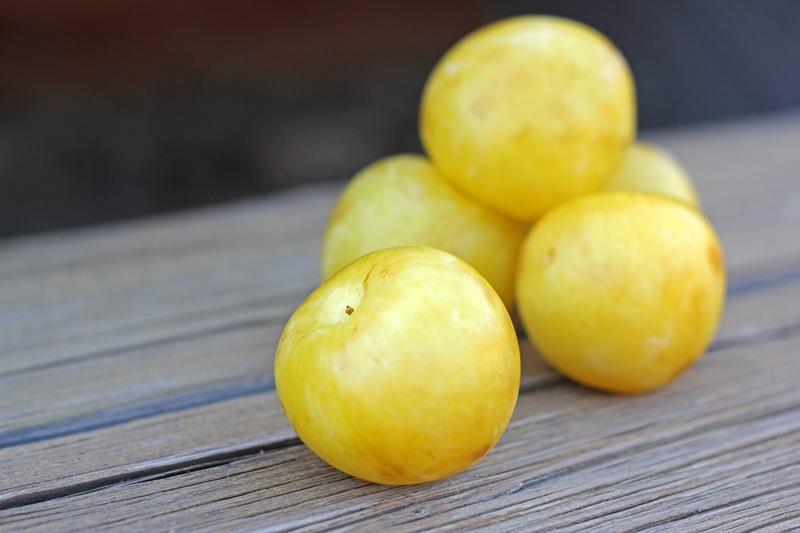 Perfect to nibble on at a barbecue or for a lazy afternoon snack, they taste of summer and I’m savoring every last bite. Wash the cucumbers well and slice them in half lengthwise, or to the size you prefer. In a bowl, stir together the kosher salt and boiling water until the salt dissolves. In a clean, sterile ½ gallon or similar sized crock, layer the sliced cucumbers, garlic cloves, coriander seeds, chiles and sprigs of dill. You may have to push the cucumbers down to make them all fit. Pour the salt water over. Push the cucumbers down so they are completely submerged. I usually move them around until they are a bit wedged down and stay covered by the water. If using a crock, you can also weigh the cucumbers down with a small plate topped with cans. Cover the jar with cheesecloth and let it sit at room temperature for 48 hours. If it is quite warm in your kitchen, you can begin tasting after 24 hours to see if they are to your liking. The warmer the temperature, the faster they will ferment so it may take a few days or up to a week. Once you like the flavor and texture of the pickles, begin eating them and store the covered jar in the fridge for up to one month (the cold air slows down the fermentation). 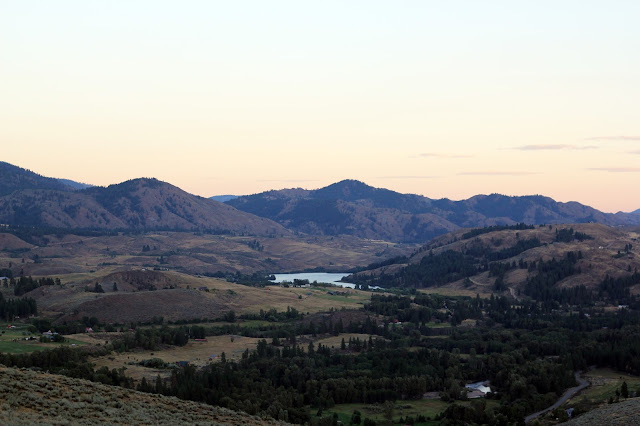 Thank you for all your good wishes on our move to the Methow Valley! I’m looking forward to a delicious time here and can’t wait to share about it. Before I left Seattle this last time, I spent a beautiful morning at the Ballard Sunday Market with my dear friend, Julie, and then stopped by our neighborhood berry stand on the way home. All morning, I couldn’t resist flowers, half-flats of raspberries and blueberries, carrots, basil, pickling cucumbers (recipe to come soon!) and more. Spreading everything out on my kitchen counter made me very happy! And made me realize I’d better get cooking since I was leaving the next day. I had to make something with blueberries because they are my favorite berry and I haven’t shared nearly enough blueberry recipes here to truly represent my love of them. I’ve baked a couple of blueberry pies this summer and still need to make a grunt or a slump – I just love some of these names! Another fun one to say is fool, and given my affection for English desserts I decided on this one. A fruit fool is a classic dessert of fresh fruit and cream and traditionally made with gooseberries. The name fool is thought to come from the French word fouler, meaning to mash or press. Since I’m loving coconut cream these days, I used it in place of the usual whipped cream. In fact, I ended up with a trifecta of coconut! The blueberries are quickly simmered in coconut water and coconut sugar, left to cool and then folded into billowy coconut cream. Pure bliss. Definitely the kind of comfort dessert I crave most often. The fool looks pretty served in martini glasses or champagne coupes, so maybe pull a few more out when you’re mixing summer cocktails. 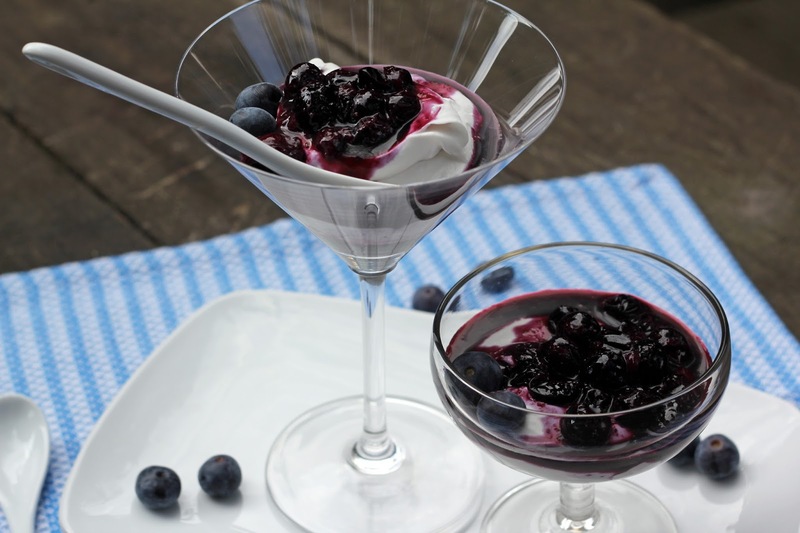 This dessert is lightly sweet, with a fresh pop of blueberries and decadent coconut cream. 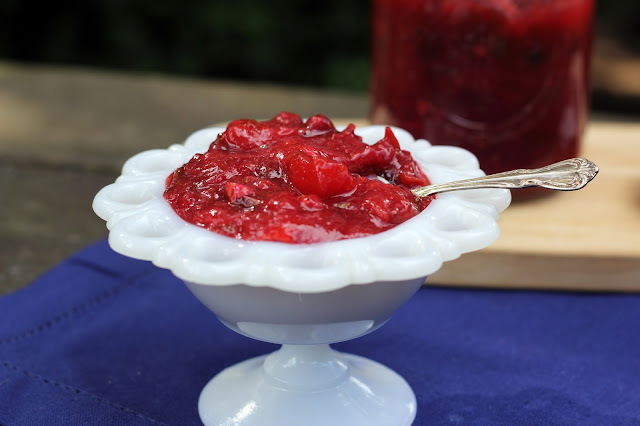 It would be a wonderful way to finish a lazy dinner on a hot evening, and I can also assure you that it travels well in a jar for the next day’s breakfast. In a medium sauce pan, bring the ½ cup blueberries, coconut palm sugar and coconut water to a boil. Reduce the heat and let simmer for 3 minutes. Chill the berries until ready to use, at least 2 hours. 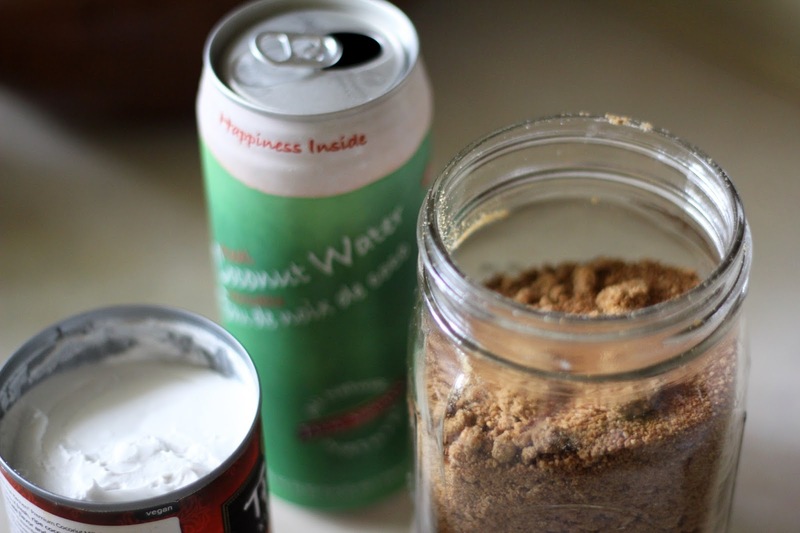 When ready to serve, open the chilled can of coconut milk. Carefully scoop the solid white coconut cream into a bowl. Reserve the clear liquid for smoothie making or add to the water when cooking dried beans. Using an electric mixer, beat the coconut cream on high until smooth and luscious, about 3-4 minutes. Add the vanilla and beat for a few seconds to mix in. 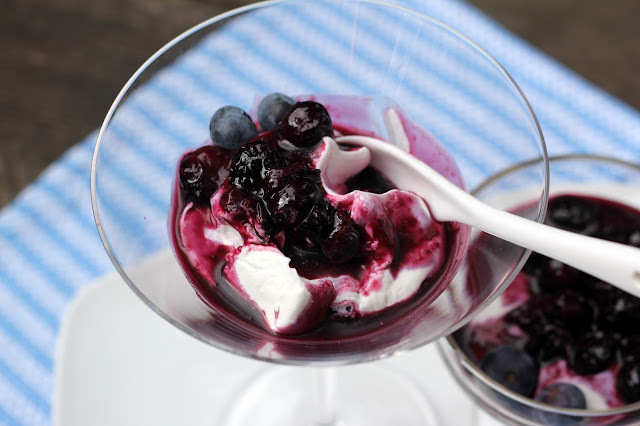 In 4 pretty dishes or glasses (martini glasses or champagne couples work well), spoon dollops of cream in each, add a spoonful of blueberries, and then dollop with more cream and then more berries to layer. Gently swirl a spoon once or twice to mix, being careful to not mix too much – you want streaks of cream and berries. Serve right away. If you want to prepare ahead, keep the dessert chilled. The cream will begin to firm up as it sits. We are well into August and it has been an exciting, busy month for our family. We moved! This is a recent decision, inspired by a desire for a bit of change with my older son, Sam, leaving for college. For the past two years, we’ve been coming to our little cabin in the Methow Valley for long weekends and school breaks. We love our time here and, more and more, are drawn to this stunning, rural area. With Sam’s departure to the University of Oregon, we are in a natural period of transition and we thought this might be an ideal time to shake things up. So Bob, Isaac and I decided to reverse our Seattle-Methow Valley balance and live in our cabin full-time, with Seattle reserved for long weekends and school breaks. This lead to a flurry of activity as we rapidly shifted our lives to this magical place for the coming year and enrolled Isaac at the local high school. We are now all tucked into our tiny house high on a hillside, surrounded by sage brush and open land. 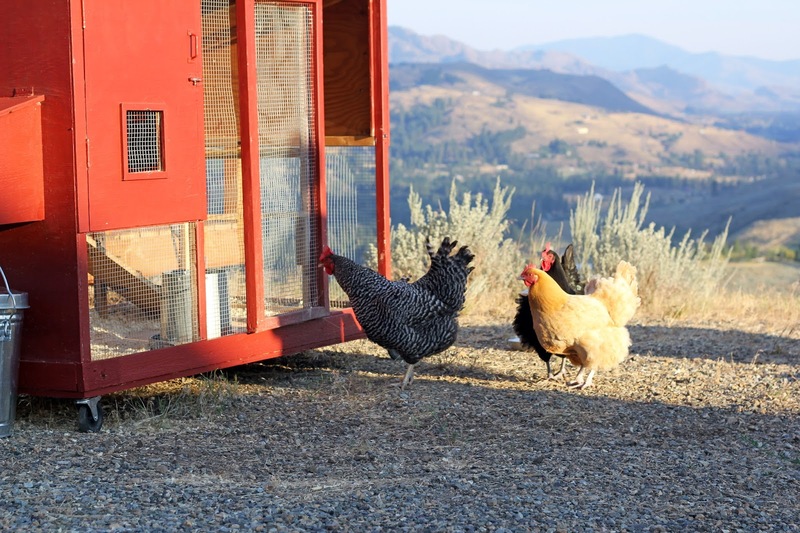 The chickens arrived last week and the move feels complete. Our new daily life includes dirt roads, deer peeking in our windows and a chorus of coyotes and crickets at night. I’m loving every moment. There’s a vibrant food scene here in the valley with an abundance of farms and orchards, weekly markets, a winery and a cider house. 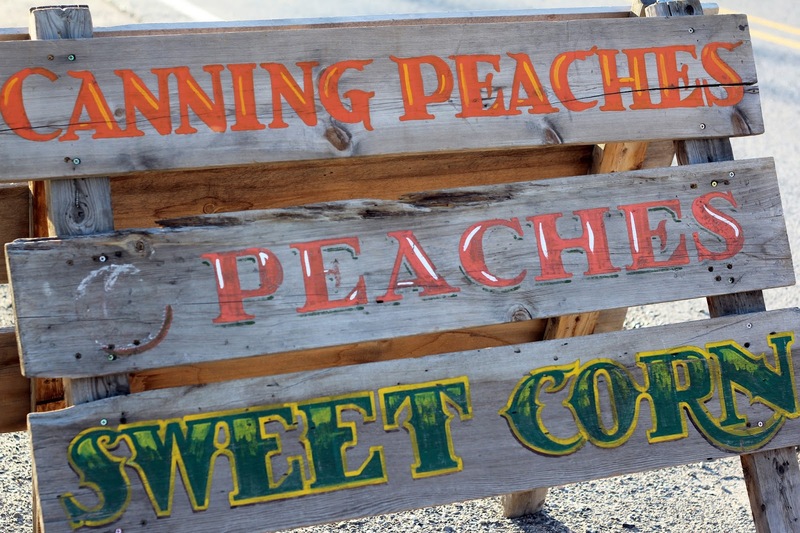 Eating and drinking local is quite delicious. 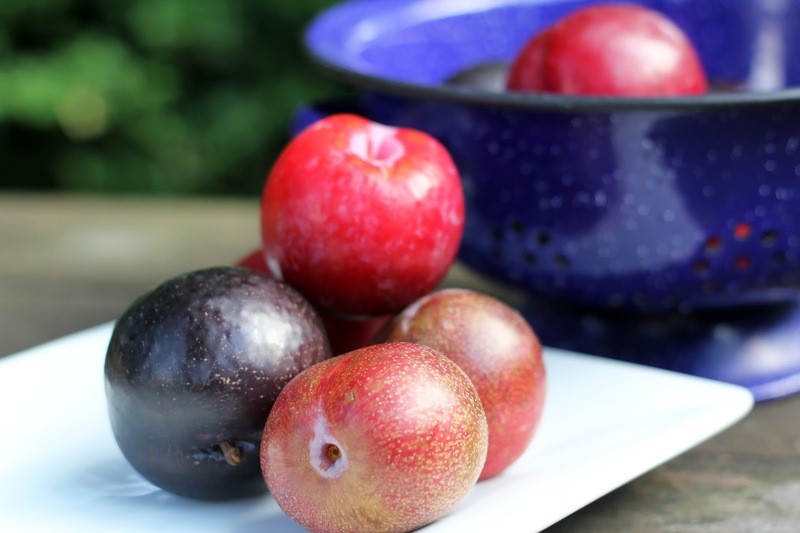 At the market, plums are spilling over with their intoxicating fragrance and in various shades of red, black and even sunshine yellow. 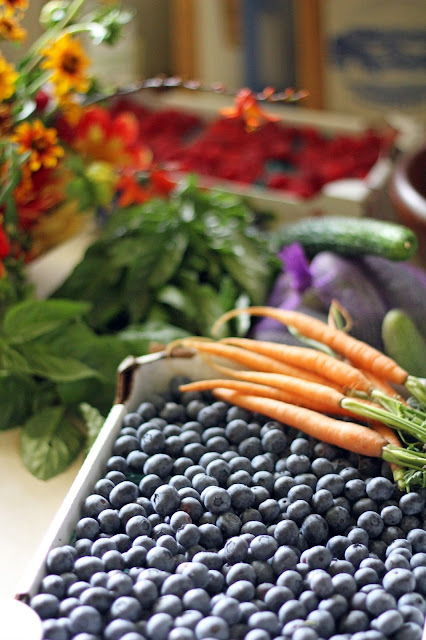 We are devouring them by the pound, enjoying their juicy goodness. To celebrate the abundance of plums, I made chutney. 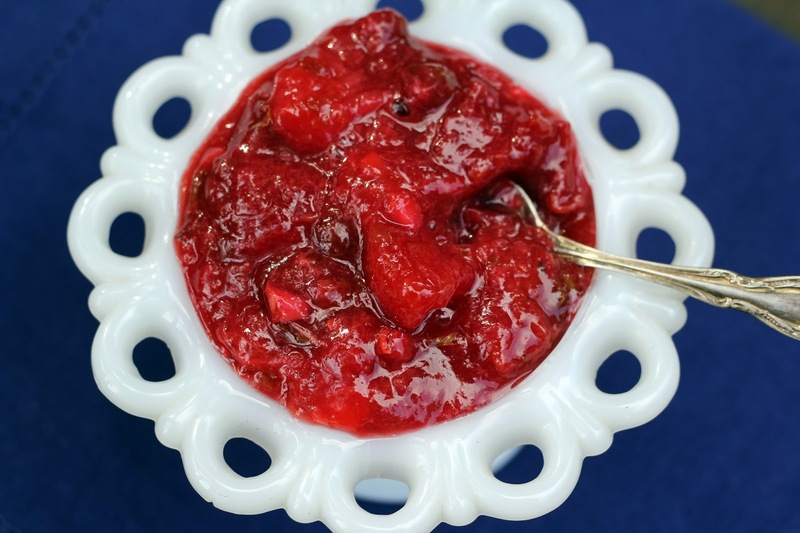 Chutney is a marvelous condiment with an explosion of flavors – sweet and savory, spicy and tangy. 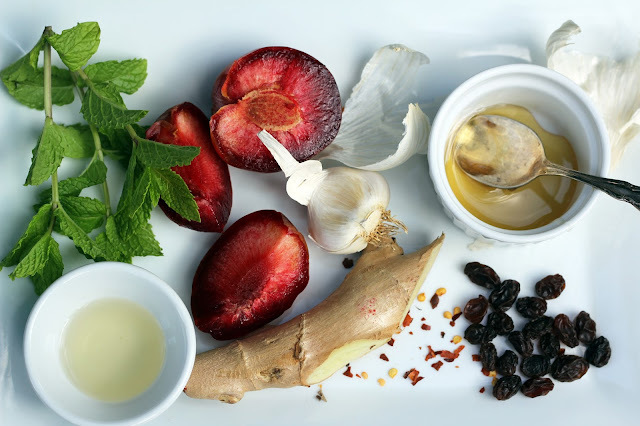 Ginger, garlic, chili, vinegar, raisins and honey combine with the deep sweetness of plums beautifully. Quick to make, this chutney turns a rosy shade of magenta, adding a colorful splash alongside grilled fish or chicken. I’m having fun cooking in the cabin kitchen, finding new rhythms and embracing this time. Sam and Isaac are starting their new schools soon and we are off on an adventure. As I step into this next chapter of our lives, I’m grateful for the opportunity and can’t wait to see what this year will bring. Combine all of the ingredients except the mint in a large sauce pan. Stir and bring to a boil, then lower the heat and simmer for about 25 minutes, until syrupy and thickened. Stir often to prevent sticking or scorching and lower heat if necessary. When the chutney is cooked to your liking, remove from the heat, stir in the fresh mint and let cool. Store in the fridge for up to a month.